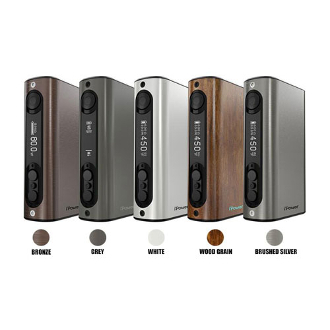 As hinted in its name the iPower 80 Watt Box Mod is one powerful device! It is a firmware upgradable variable wattage/temperature control mod that contains a preinstalled 5000mAh Battery. The Mod can vaped and charged at the same time using its pass thru function through the usb port located on the bottom. This usb port also acts as your cable cord for future firmware upgrades. Included in its specs is its 510 spring loaded stainless steel threading and pin. The material of the device helps your threads to last as long as possible and resists against the average wear and tear. The entire mod itself is very durable and can handle the toughest of vapers! The iStick Power has a factory reset button which can be used by holding the up button and the reset button simultaneously in case of an error or if the device does not power back on after an upgrade. There is also a circuit protection system. It has both software and hardware battery protections that include: over charging, over current, and over discharging.